No matter how simple or complex your control system the most important decision you make when setting up a car is the gear ratio, even the best electronic motor controller cannot overcome the effects of choosing the wrong gear. If too low a ratio, i.e. smaller than ideal motor sprocket, the car will not go as fast as it could but at least you'll have lots of battery capacity left; if too high a gear at best the car will run out of power before then end of the race, at worst you'll burn out the motor. 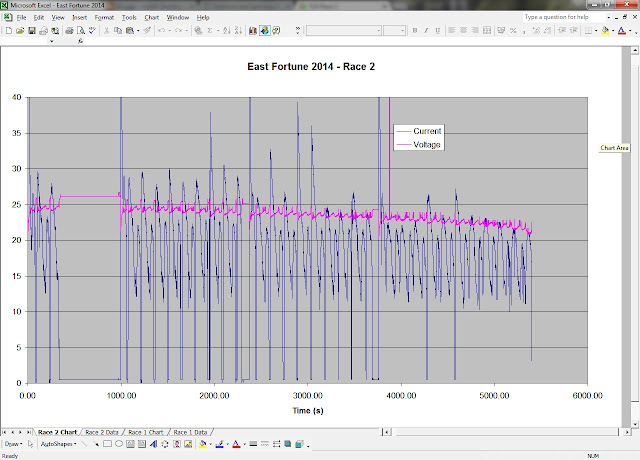 This is a graph of Minion's data from race 1 at East Fortune in 2014, a perfect example of too high a gear. At 4200 seconds the battery voltage is already dropping below 20V which is bad, the race was already won at that point so we tried to call the driver in but he clearly didn't understand and happily carried on until the voltage dropped below 10V, that's very bad! The peaks are uphill and the troughs downhill, so basically the faster the car goes (with a fixed single gear) the lower the current draw and vice versa. The cause of this error was underestimating the severity of a corner and the following climb so for the next race the gearing was lowered by about 7%. You can see how the current has dropped by about 4A, despite this the best lap time in race 2 was only 0.5 seconds slower than race 1, so the higher gear reduced hill climbing ability whilst increasing power consumption. The obvious gap after the first lap is not one of our finer moments, when the motor sprocket was changed between races we forgot to fully tighten the grub screw hence it came loose and drive was lost. On the plus side the remainder of the race was an exciting chase of the Alford Express by Minion with the catch being missed by just 14 seconds. I hope this demonstrates the importance of data and how just a couple of parameters can transform you decision making. This brings us to the question of what gearing to use on at another circuit, such as Kirkistown. The east side of the Ards Peninsula seems to one of those rare places where Google Earth doesn't have data so we're not sure of the layout or the topography, however I've heard that it's very flat and fast so we'll assume there are no restrictions on those scores. We think the shape is fairly good and it's not a big car by any means, neither is it heavy, a reasonable estimate might be that it's capable of averaging 27mph at a current of 17A which a decent pair of batteries should be able to give in an F24 race. It is a good idea to be cautious and aim for 22mph at a target current of 13A. 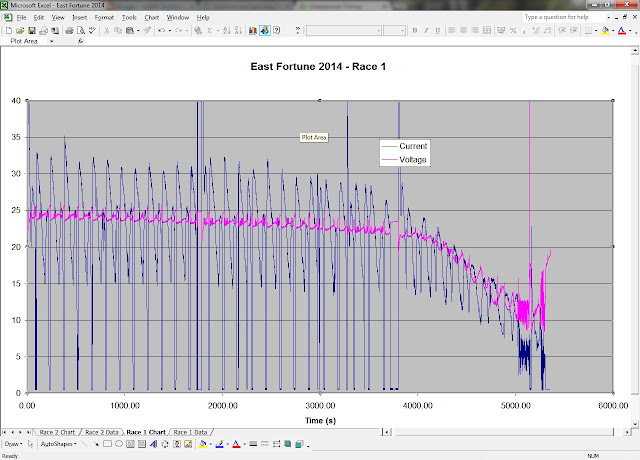 Our motor is not new and doesn't follow the published performance chart but we know that at 2230rpm it draws 13A. 22mph x 1609 = 35398metres per hour = 590metres per minute. Basically a 13 tooth sprocket should get us fairly close to our target speed, we may find it goes faster than expected and in the process draws less current, but at least we can be confident of not flattening the batteries early. If all goes well the gearing can be increased between races.